Last week, I discovered a recipe for Roasted Caprese Salad by Samantha Ferraro, author of The Little Ferraro Kitchen blog. I'm a huge fan of tomatoes once they come into season for the summer. The off season product with its mealy bleach-looked flesh is not worth eating. Tomatoes in season are vibrant red all the way through, juicy and flavorful--a flavor that's hard to describe given the complex interaction of multiple flavor compounds that are responsible for tomatoes' unique taste. 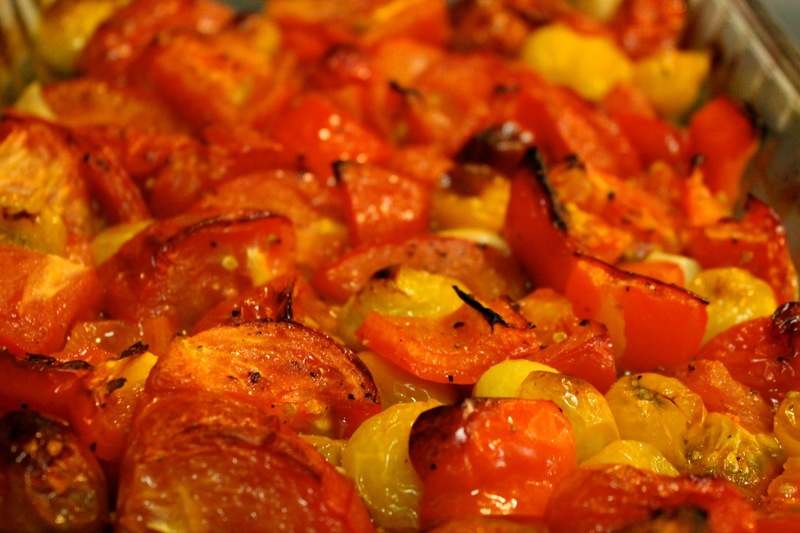 As good as ripe, fresh tomatoes are, roasting tomatoes puts them on a whole other plane. It brings out their dark side: enhancing their umami qualities and sweetness. Tomato Panzanella is one of my favorite things to make with tomatoes. Reading Ferraro's recipe got me thinking that I could adapt it into a pretty incredible panzanella, which is exactly what I did here. The roasted tomatoes are what makes this dish really special. I love fresh ones in panzanella, which is certainly faster. But I'll definitely be making this again. And again. 1. Preheat ove to 500 F. Combine both types of tomatoes, red pepper and garlic in a 9 X 13 roasting pan. Drizzle with 2 tbsp. olive and season with kosher salt and freshly ground black pepper. Stir vegetables to coat with oil and salt and roast until the tomatoes have softened and become wrinkly and brown in places, about 45 minutes. Set aside to cool a bit. 2. Preheat the oven broiler with rack in the top position (about 4-5 inches from broiler). Toss bread with 1 tbsp. olive oil, spread out evenly on a large baking sheet, and toast under the broiler until lightly browned, about 2-3 minutes, turning the bread every 30 to 45 seconds or so (watch carefully to prevent burning). 3. Add the basil to a food processor and pulse a few times to break up. With the machine running, slowly stream in the remaining 2 tbsp. olive oil through the feed tube, then add the vinegar. Scrape down the sides and pulse again as needed for consistency. 4. 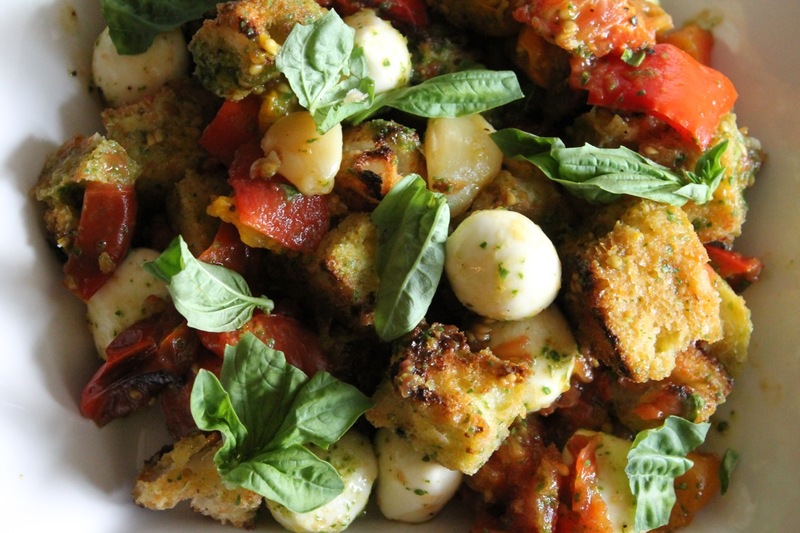 Combine the roasted vegetables, bread, basil dressing and mozzarella balls in a large bowl. Toss to combine. Serve in large shallow bowls topped with torn basil leaves. This was a really amazing dish. Roasting the tomatoes is genius. I'm glad you plan to make it again!